As featured in Hello! magazine's round-up of the Best Supermarket Wedding Cakes - delicious and stylish cakes that help save the pounds without compromising on quality. A three tier cake (25cm, 20cm and 15cm) of rich fruit cake covered with marzipan, covered in ivory soft icing and decorated with dots. This product is supplied ready to serve. 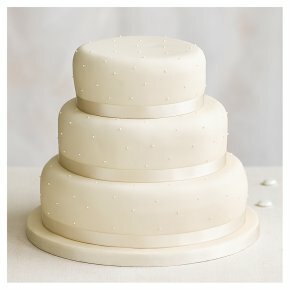 Filling Choice: Consists of 3 tiers of rich fruit cake wedding cake covered with marzipan. To order a wedding cake up to 1 year in advance, please call 0800 188 881 or visit your nearest branch. Fiona Cairns is a top pastry chef who has worked with us for over two decades, creating beautiful wedding cakes that are lovingly baked and hand decorated by Fiona's highly skilled team. The team have even catered for royalty, creating the wedding cake for the Duke and Duchess of Cambridge in 2011. Perfect when paired with our Fiona Cairns Undecorated Celebration Cupcakes.